September arrived as a misty morning, and the sun took some time to break through the haze that covered the Rectory gardens until mid-morning. The rain was so heavy yesterday that the Desmond Rowing Club cancelled rowing on the River Deel in the evening. There is no doubt that summer is over and that autumn has arrived. It has been a fresh autumn day, with bright sunshine. Hopefully the sun stays for the weekend, and the Askeaton Regatta, which has already been postponed once, can go ahead on Sunday afternoon [3 September 2017]. But there is a noticeable change in temperature. The T-shirts have gone back into the wardrobe, probably to stay there until I head back to Greece in April. I was writing this morning about how I had returned from Athens last week with a box-set of four CDs, 40 χρόνια Μαρία Φαραντούρη, subtitled The Very Best of Maria Farantouri, that includes a collection of 80 songs recorded by Maria Farantouri, many of them from her close work with the Greek composer Mikis Theodorakis. κι έπαψ’ ή βουή του κόσμου, πήγαν τα παιδιά για τσάι. όλοι που μας αγαπάνε, λοχαγοί και βασιλιάδες. όλοι εκεί βασανισμένοι μαύροι κι άσπροι από τους άσπρους. κι αχ, ή Αγγλία μας ή καημένη, λοχαγοί και βασιλιάδες. πέντε δόντια από παιδάκι, λοχαγοί και βασιλιάδες. The translation is part of the translation by Vassilis Rotas of Brendan Behan’s play, The Hostage, which was staged in Athens 55 years ago, in late 1962. Immediately after that staging, four songs were released by Dora Giannakopoulou. By the songs attracted the wrath of the Greek censors. Theodorakis decided to bypass the censors and to make the songs available to a wider audience and to release the words through the newspaper Avgi, inviting to readers to bring along a blank tape. Later, Alekos Patsifas recorded the first album with full orchestra with the composer. An album was recorded with Maria Farantouri in 1966, but because of the colonels’ junta it took another seven years before it was released. The song tells of a young English soldier is being held hostage in a Dublin brothel in reprisal for an IRA prisoner who is to be hanged in a Belfast prison. The hostage falls in love with an Irish maid servant, but his death will put an end to love and to life. Vassilis Rotas presents the militant progressive spirit as a challenge to nationalist insanity and religious fanaticism that demand the sacrifice of an innocent victim. The song has become a regular part of the repertoire of Greek singers and performers on stage and on television, such as Dionysis Savvopoulos a popular singer-songwriter from Thessaloniki. Savvopoulos has been politically active throughout his career in music, and he was briefly imprisoned by the colonels and beaten in 1967 for his political convictions. A bilingual version of ‘I remember in September,’ has been recorded in English and Greek by Alexia and Dimitris Tsopanellis. An English language version, set to the music by Mikis Theodorakis, was recorded by Julie Dennis with other Theodorakis composition in Munich in 1995. When all are dead who love us, oh the Captains and the Kings. And the draughts and chess relinquished, oh the Captains and the Kings. So let’s drink up and be merry, oh the Captains and the Kings. And what do you think I found there as I wandered in the dark? Five baby teeth had written of the Captains and the Kings. Old ladies with stern faces, and the Captains and the Kings. Before leaving Athens at the beginning of last week, I bought box set of four CDs by Greece’s best-known singer and political activist, Maria Farantouri, who turns 70 later this year on 28 November. 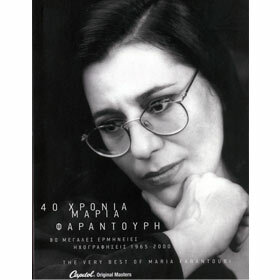 The CD collection, 40 χρόνια Μαρία Φαραντούρη, subtitled The Very Best of Maria Farantouri, was released ten years ago in 2007, and includes 80 great songs recorded by Maria Farntouri between 1965 and 2000. I have been enchanted by the voice of Maria Farantouri (Μαρία Φαραντούρη) ever since she began working closely with the Greek composer Mikis Theodorakis and singing the songs of resistance to the colonels’ regime, which came to power in a coup 50 years ago in 1967 and was toppled in 1974. During the military regime, she recorded protest songs in Europe with Theodorakis, and also worked with the Australian guitarist John Williams. She has recorded poems by Federico García Lorca, and songs in Spanish, Italian and English, including ‘Joe Hill,’ ‘Hasta Siempre Comandante Che Guevarra,’ African-American spirituals and songs by Bertolt Brecht. She has worked with many other modern Greek composers, including Manos Hatzidakis, Eleni Karaindrou, Michalis Bourboulis and Vangelis. She was briefly involved in Greek party politics, when she sat in the Greek Parliament for the Panhellenic Socialist Movement (Pasok) in 1989-1993. Her husband, the Pasok politician Tilemachos Chytiris, was a press minister in successive Greek governments at a time when I worked regularly in Greece. The first two tracks on this collection, Άσμα ασμάτων (Asma Asmáton) and Ο Αντώνης (Antónis or Anthony) are from Μπαλλάντα του Μαουτχάουζεν (The Ballad of Mauthausen), a cantata written by Iakovos Kambanellis and Mikis Theodorakis in 1965, 20 years after the end of World War II, and recorded in 1966. Tracks 3 and 4, Ήταν 18 Νοέμβρη (On 18 November) and Το γελαστό παιδί (The Laughing Boy) celebrate the uprising in the Athens Polytechnic on 17 November 1973 that led to the downfall of the colonels within a year. The Laughing Boy (Το γελαστό παιδί), composed by Mikis Theodorakis, was first included on the soundtrack of the 1969 movie Z, and quickly became associated with resistance to the fascists of the Greek junta. For Greeks, it is a song about the death of so many young people killed resisting the regime. When the regime was toppled in 1974, Mikis Theodorakis and many singers organised a concert to celebrate the return of democracy to Greece, and Maria Farantouri sang one of the most touching songs of the time. There was a palpable response when she intentionally changed the original reference to August to the month of November to honour the students killed in November 1973. The original Greek lyrics are by the poet Vassilis Rotas, but they are based on earlier poem by the Irish playwright Brendan Behan. The original laughing boy in Brendan Behan’s poem is Michael Collins, who was shot dead in the Irish civil war 95 years ago on 22 August 1922. Mikis Theodorakis adapted the Greek translation, and adapted it in the context of Grigoris Lambrakis, the pacifist activist killed by far-right extremists in Greece in the years before the colonels seized power. Some years ago, my friends Paddy Sammon, a former Irish diplomat who was once based in Athens, and Damian Mac Con Uladh, an Irish journalist from Ballinasloe now based in Corinth, have researched the Irish background to this great Greek classic of resistance to oppression. As Damian Mac Con Uladh has written, every Greek knows the song can sing some of, which they learned at school commemorations. Behan wrote the poem in the mid-1930s when he was still only 12, and later adapted the poem in his play The Hostage (1958). The play first came to the attention of Theodorakis while he was living in Paris, and he was inspired to compose a cycle of 16 songs in 1962 with Greek lyrics written by Vasilis Rotas (1889-1977). Rotas’s translation of The Hostage was staged in Athens in 1962 at a time when the Greek civil war was still a taboo topic and left-wing activity was under close police surveillance. The play become a way for people to identify with their struggle against a repressive regime. In the Greek version, the GPO, Mountjoy, Pearse and Ashe are replaced, gone is the Irish phrase Go raibh míle maith agat (‘Thank you a thousand times’), and the remaining reference to the English has lost its context and seems out of place. Paddy Sammon points out that the song was given new life when it was featured on the soundtrack of the Costa-Gavras movie Z (1969) about the assassination of Grigoris Lambrakis. Maria Farantouri went into exile after the coup d’état in 1967, and sang this song at solidarity concerts across Europe. ‘It became a hymn not only for the Irish liberation movement, but also for every liberation movement in the world, and Greek democracy,’ she told an RTÉ radio documentary. When the junta sent in tanks against protesting students at the Athens Polytechnic on 17 November 1973, killing at least 24 people over a number of days, Farantouri added a couple of stanzas to the song, and changed the date from August to November, deliberately linking the song to that event. As Damian Mac Con Uladh has pointed out, the song has developed more associations in recent years, including the murder of Alexis Grigoropoulos, a 15-year-old boy, by a special policeman in 2008, and the murder of the rap artist Pavlos Fyssas (34) by a neo-nazi Golden Dawn supporter four years ago on 17 September 2013. That an Irish son, with a rebel gun, shot down my Laughing Boy. σπάσε καρδιά μου εχάθει το γελαστό παιδί. θα 'ταν τιμή μου που 'χασα το γελαστό παιδί. δόξα τιμή στ' αξέχαστο το γελαστό παιδί. my heart broke for we’ve lost the laughing boy. one of our own have killed the laughing boy. it would have been an honour to have lost the laughing boy. Glory and honour to the unforgettable laughing boy.